Stellar Industries, Inc., located in Garner, Iowa, was established in 1990 as the first North American corporation to design and manufacture the hydraulic hooklift. Since its inception Stellar has created over 40 different models within the single-pivot, double-pivot and sliding jib lines. Through the years Stellar Industries has developed, acquired or partnered with many truck equipment products, accessories & components, beyond the hydraulic hooklift. A wide range of accomplishments & an ever changing business model have marked the unique 25+ year story of this dynamic American industrial organization. However, there are also two “constant characteristics” of the organization that equally contribute to Stellar Industries story & identity. 1. Centralized operations in the “Heartland” of the United States of America! Mission Statement: Stellar Industries, Inc. is dedicated to being the preferred supplier of quality hydraulic truck equipment and related accessories through innovative, responsive, and cost effective solutions to meet our customers’ needs in a positive work environment while providing a profitable return for our shareholders. Our Core Purpose: To make our customers more productive. Our Core Values: Treat all employees with dignity and respect. Work together to exceed customer expectations. Committed to being a valued member of our communities. Our Core Goal: We will be the benchmark company of the truck equipment industry in terms of supplier relations, financial performance, and customer satisfaction. 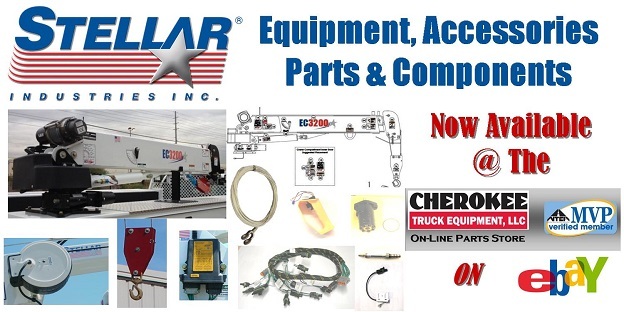 Cherokee Truck Equipment, LLC is an Authorized Dealer/Distributor of all Stellar products, as well as a, Proud Partner of Stellar Industries, Inc. The Mechanic Truck by Stellar Industries offers the most complete turnkey packages available with a heavy duty steel body, air compressor, drawer system and available options. The Stellar® TMAX™ Propane Gas Service Trucks are extremely versatile. They make transporting, loading and unloading gas cylinders a simple, single-person operation without the need of a trailer or additional setting equipment. Stellar® Tire Trucks use state-of-the-art design and materials to produce the most modern design tire trucks available in the North American market. Our tire truck bodies, cranes, and compressors include features not found on competitive tire service trucks. Stellar® cranes bring more value added features to the market than any competitive crane in its class. The design parameters were developed using months of input from users throughout North America. When it comes to the Stellar® Hooklift System, simplicity of design and operation are top priorities. With a single truck, an operator can load, unload or change bodies without leaving the truck cab. This drastically increases efficiency and productivity while cutting down on operational costs and maintenance. Through innovative thinking, Stellar has improved the cable hoist design. Characteristics include increased dump angle, fewer cylinders and seal kits to maintain. Other features are improved cable routing, use of stainless steel pins, grease zerks, bushings, and the use of wear strips. All of these features are offered at a competitive price. The Stellar Industries Container Carriers can meet all your container delivery, switching and now dumping needs available with the optional 360° rotator attachment.Stellar® Container Carrier features include improved visibility of rear lights, less cylinders and seal kits to maintain, and an overall heavy-duty construction and the ability to move front-load and rear-load containers. The Stellar Industries container tarping system offers easy installation, smooth, convenient operation and most importantly, it’s the toughest, most maintenance free tarping system available.When it comes to your company’s bottom line, the proven SI Tarping System will keep you in the black. Tarping systems are available for hooklifts and cable hoists. The complete X-Tra-Lift pick-up loading devices are a giant leap in the truck accessory market. With the use of hydraulic technology, advanced engineering and the use of aesthetically pleasing materials the X-Tra-Lift will make your pick-up truck more useful. The Stellar Model 6000MH hydraulic articulating crane was created with the railroad industry in mind, but is applicable to many markets. The 6000MH has two 70” hydraulic extensions with a maximum horizontal reach of 26’ 5? and a maximum vertical lift of 29’ from the base of the crane. Stellar Industries has chosen to use the American Eagle Accessories Group truck accessories as they are the most dependable, most rugged and trouble-free products available in the North American market today! Like our service trucks, the American Eagle Accessories Group products are built to the highest standards.